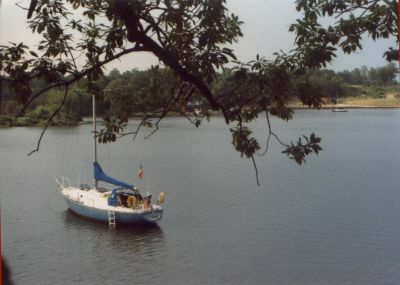 The original Coquina was a full keel 25 foot boat purchased in 1972 that may have been a Sea Star 25. She was similar to an Alberg or Cape Dory hull form and was made of translucent green fiberglass that reminded us of the coloration found on some coquina shells. 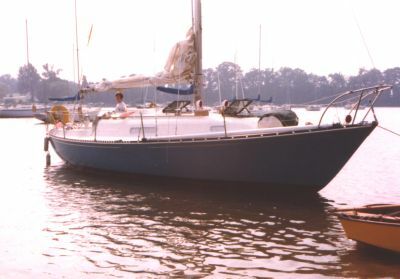 This boat was really too heavy for typical light air days on the Chesapeake, so she was sold and the next Coquina was a Columbia 26. 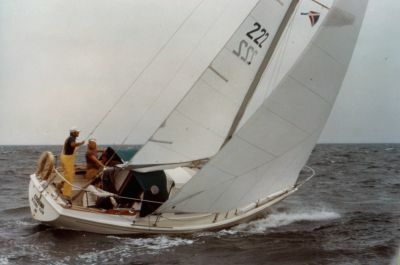 That boat proved less than an ideal sailing boat as well and was quickly sold in order to buy a Pearson 30. The third Coquina was hull number 222 and the only boat we ever bought brand new. We paid about $16,500 for this boat complete with spinnaker. This was a very fast boat for the time and served us well racing and cruising. Pearson 30s are still good boats today and can be had for a bit less than what we paid long ago. This was our first boat with an inboard engine and our introduction to the world of the Atomic 4. Today no one starts with a new one, but back then they were the engine for small and medium sized sailboats. We had no trouble at all with the engine the entire time we had the boat. Some thanks go to Pearson for using monel for the fuel tank instead of the more common ternplate tanks of that era. Those tanks will likely outlive the boats. 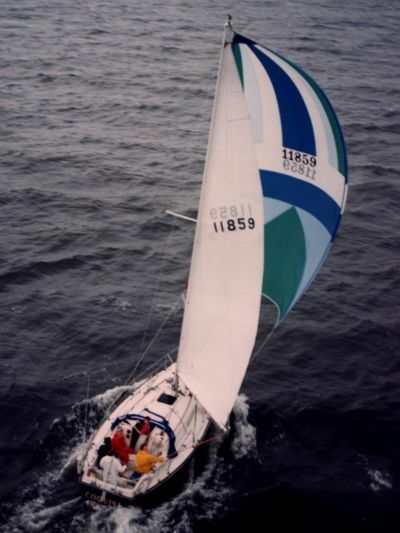 This boat was a blast to race and we lived on her for weeks at a time in the summer. This was the era when you could return from a long cruise and realistically expect to do well racing without taking half the boat apart. Tony Della Barba, my father, is at the helm in this photo. This was also the year we bought a Dyer Midget Dinghy. This little boat, slightly under 8 feet, served us well from 1973 to about 2000 as an all purpose transporter of dogs, men, women, and boys. Here it is shown under wind-scoop power. At that time the dinghy was also powered by a British Seagull, which had all the reliability antique MGs and Jaguars are famous for. The next Coquina was a Dickerson 36 strip planked wooden ketch with a diesel, pressure hot and cold water, a wood heating stove, and a shower. This was a very large change from a light and agile Pearson 30. We had plans to go offshore and this seemed to be the kind of boat to do it in. 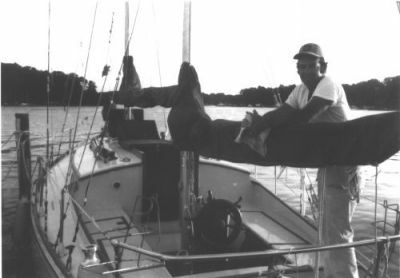 Here Tony Della Barba leans on the mizzen boom at our slip on the Magothy River. This Coquina did serve us well by making the trip offshore to Newport for the Bicentennial tall ships celebration. We discovered on the way up a ketch with the wind and seas on the quarter can be a handful to steer. 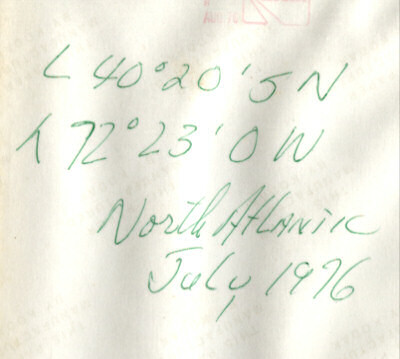 We made landfall at night, in the fog, with a clock, knotmeter, and compass as the sum total of our nav gear. This would seem suicidal now, but this is how boats navigated back when GPS was undreamed-of and a LORAN set was as big as a medium sized color TV and used about the same amount of AC current. We had a great time exploring New England and truly a wooden ketch is a much better fit where the water is colder and wind stronger than a typical Chesapeake summer cruise. Here I am at age 12 standing my watch coming home from New England. This was taken off the New Jersey coast in light air and pouring rain. It was decided that I was old enough to be on deck alone about the time the rain set in. The adults were so impressed no one volunteered to relieve me for hours LOL! Dickerson long ago got out of the boatbuilding business, but they still do have an active owner's association - see http://www.dickersonowners.org/. 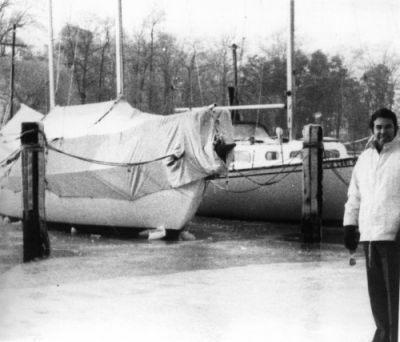 The winter of 1976 was COLD! that is the subject of this site, in the spring of 1977. My father just could not get used to traditional full keel wooden boat sailing. We did try and race the Dickerson, but a very heavy boat with a bowsprit that is slow to answer the helm is a bit dangerous on a race course and we gave up on the idea quickly. There was a C&C 35 on the Magothy that finished so far ahead of everyone else when racing it was like watching a Porsche race a bunch of Dodge Darts. We had no doubt this was the next boat for us. 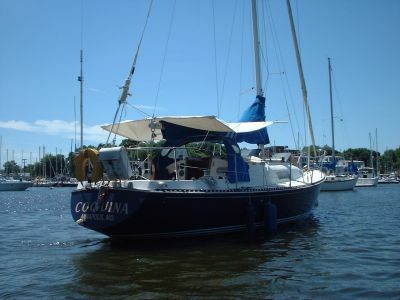 We located a C&C 35 for sale in New Jersey on the Raritan River, did the deal, and took her home. 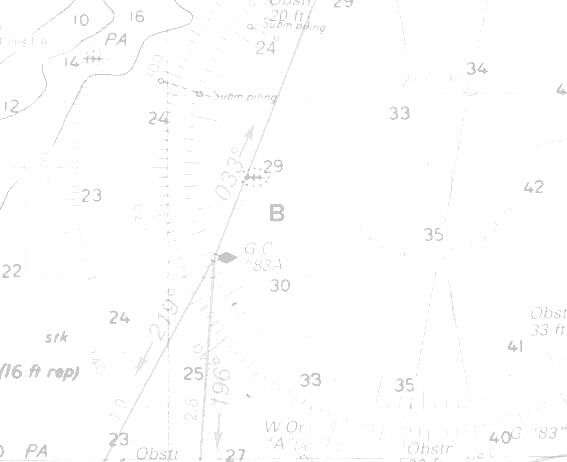 Our first trip ever outside of the sea trial was offshore from Sandy Hook to Cape May. We had winds on the beam up to 30 some knots and we flew like an express train. This photo was taken in September, 1977 in Worton Creek. Note the original light blue gel coat color. This also shows the stern of a Penguin we used for a dinghy on that trip. The Penguin sailed and rowed well, but the strain of towing was a bit much for a wooden boat that was well over 20 years old at that point so we didn't continue with it. Coquina proved a stellar performer under sail and then some. In the 21st century she may be an old boat surpassed by modern carbon fiber creations, but in 1977 there weren't too many boats that could keep up with her. Cruising her was great too, if not quite as luxurious as the last Coquina. I still miss that woodstove in the cabin on cold mornings to this day. 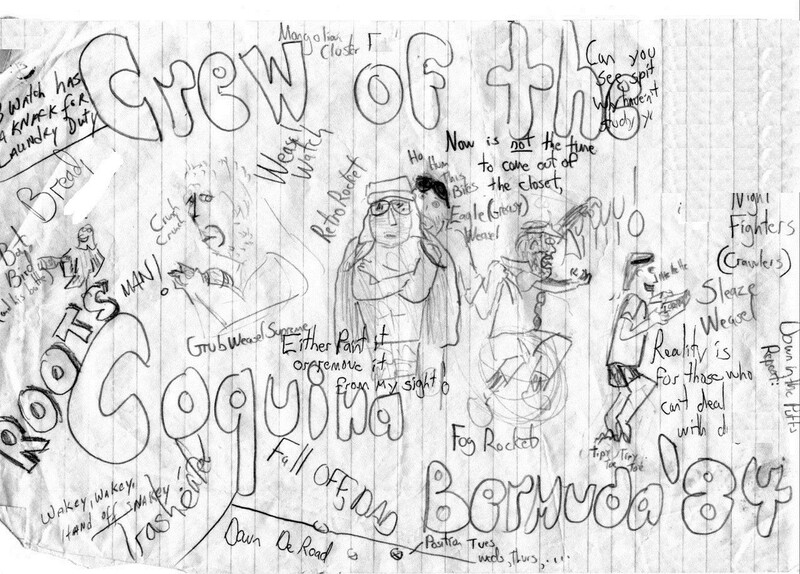 We soon got the idea to do more than local racing and entered Coquina in the 1979 Great Ocean Race. Click here to see the full story. This was one of the toughest races I have ever done to this day. One thing we discovered was the 35 MK I is a very tough boat and she will take a beating that will have the crew begging for mercy. There was another C&C 35 and a C&C 33 3/4 ton special that finished some hours behind us. This race, whiole we did it several more times, was just a warmup for what came next. We had a proven boat at this point and a good crew and Bermuda was only 750 some miles away. In 1979 we got the boat painted dark blue right before the race. The dark blue color is still her current paint job. 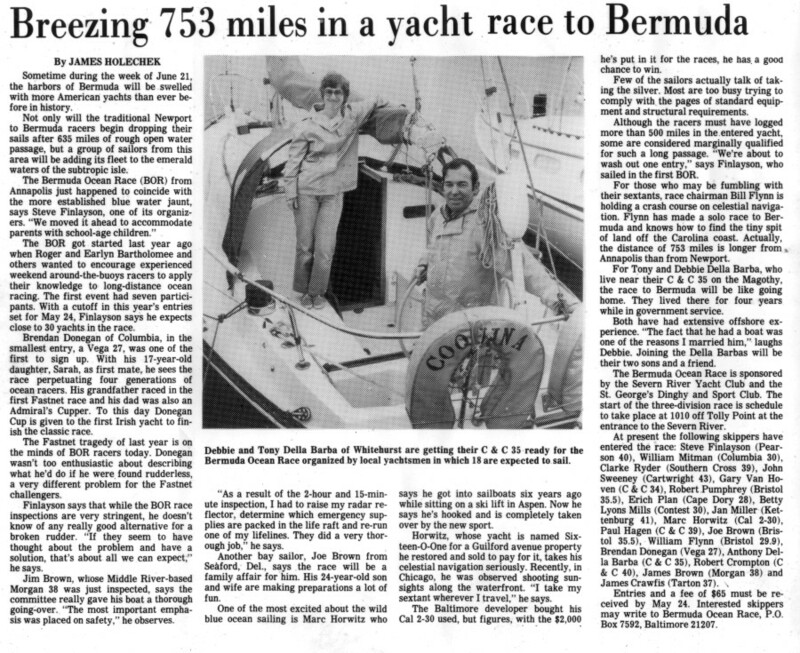 We raced Coquina to Bermuda three times - in 1980, 1982, and 1984. 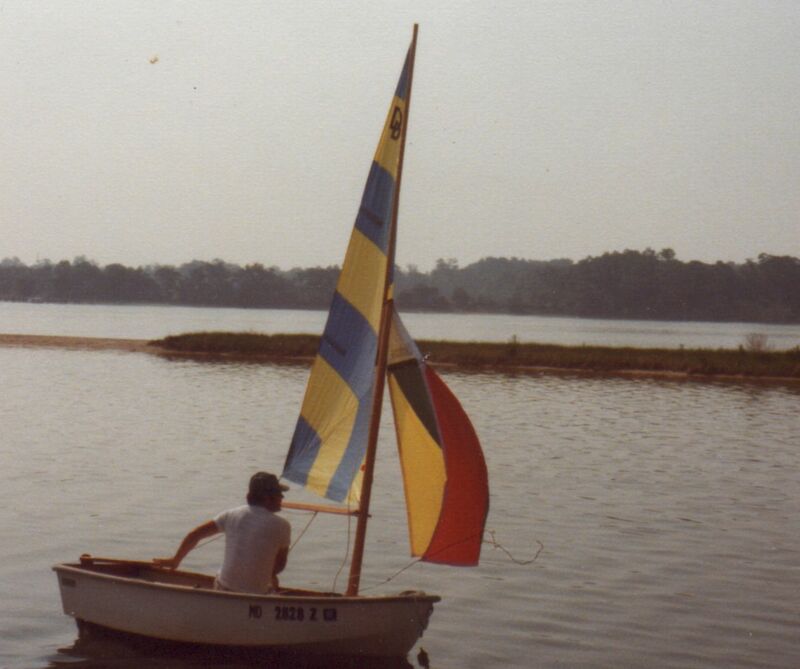 For the 1980 and 1984 races I did the return trip while my parents flew home and in 1982 we all flew home and we loaned the boat to friends of ours. 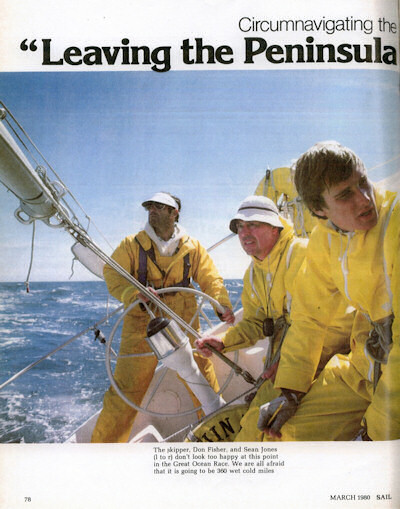 The 1980 race over was rough for the last bit, as we were still pre-LORAN and were running a sun line for latitude north of Bermuda and then an RDF bearing into Saint Georges. Unfortunately the wind came around strong from the south right then. The photo at right was taken on the race over when the topping lift failed in the Gulf Stream and I had to go aloft to repair it. Another notable event going over was sailing past a pod of humpback whales. We literally glided just feet over top of one. The trip back was what would be known now as a "hate mission". 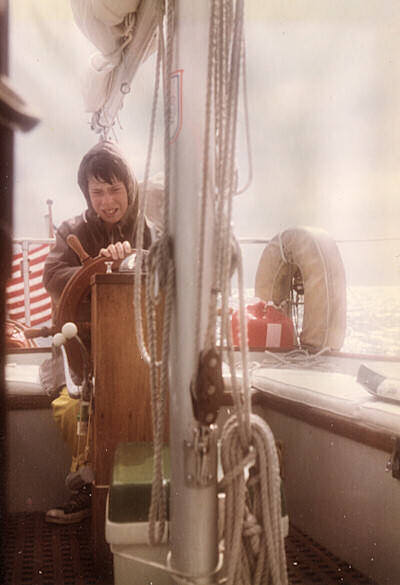 We had a series of fronts that basically required a sail change almost every watch for hundreds of miles and one unnamed crew member seemed to specialize in losing halyards up the mast for me to retrieve. The trip back in 1984 was different. I was 20 years old and deemed competent to pick my entire crew instead of just half of them. We - being ages 17 to 21 or so - were in no hurry to leave Bermuda at all, but rum isn't free and eventually between all 5 of us we had $90 total and had to get going. After we paid $80 for gas (in 1984!) we had enough money to buy breakfast for 2 people. We ended up leaving right at noon into a freshening breeze and put the hammer down with a reefed main and number 3. By breakfast we were down to a double reefed main and working jib. I was making pancakes on the stove when we saw a steel ketch to windward of us. They were running under bare poles and looked to be rolling so bad they might capsize to windward or leeward. We did 170 miles noon-to-noon the first day out. By the second day we were beam reaching in 20 foot breaking seas with the rail down under double reefed main and storm jib. Steering was like the best thrill ride ever invented combined with sitting at the bottom of Niagara Falls with speeds in the double digits as we surfed down the face of the waves. Our second noon-to-noon was 180 miles, which still stands as our 24 hour record. When we got in VHF range to call home everyone though we had turned around because of the storm and gone back to Bermuda. Not so, we were getting ready to put in to Cape May for a steak dinner and showers. 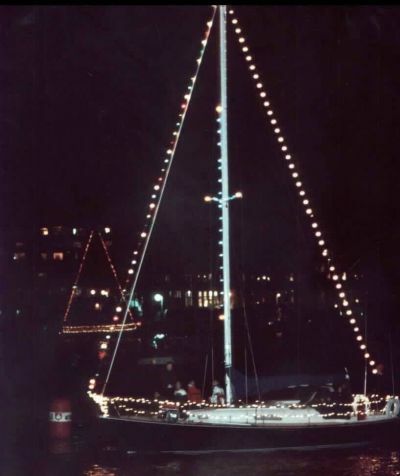 This is the famous Parade of Lights put on by the Eastport Yacht Club sometime in the early 1990s. This event is still put on every year with ever increasingly complex designs. The photos below show a tornado/waterspout coming up Queenstown Creek, which made it seem like a good idea to break the raft up! 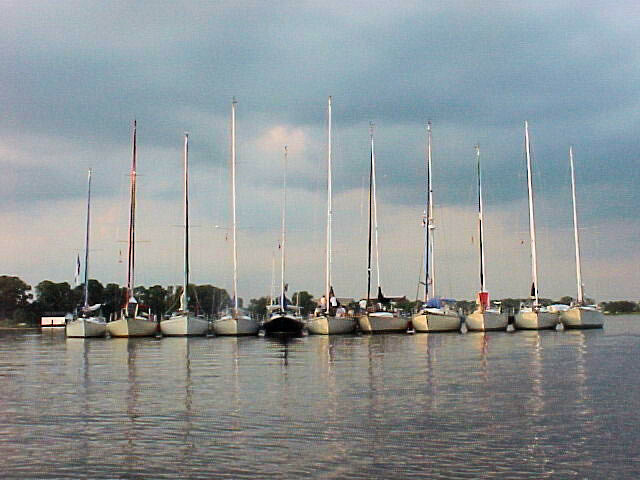 The boat to the right is Karen Lee, a C&C 34. This photo shows Coquina headed down the Bay in a Governor's Cup race in the late 1980s. 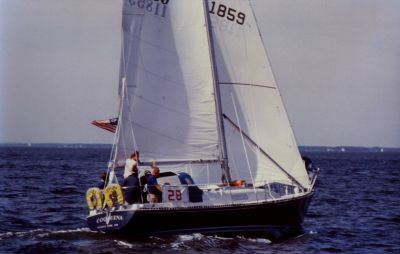 Here Coquina is rafted to Dream On, a Pearson 30. This boat was owned by one fried and now sold to another. Like our Pearson 30 form 40 years ago, she still is a great sailing boat. Coquina near the center of a lot of C&Cs in 2000. 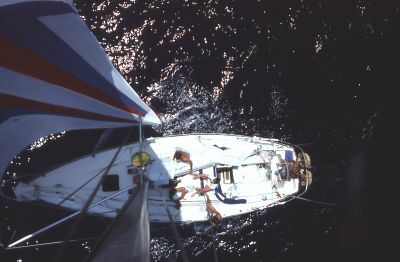 Noah Della Barba, born 2001, on his first sail with his mother Maureen. He is the third generation to sail aboard Coquina. He is the "Son of a Son of Sailor". 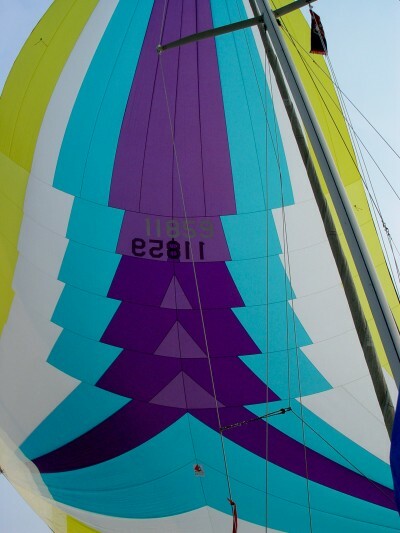 The newest sail in our inventory - a Haarstick triradial spinnaker.